This conversation, as part eleven in our weekly Nashville Quilt Project round-up, features 14-year-old Oasis Center student Jennifer. The Nashville Quilt Project is a 50-foot mural located on Charlotte Pike for which founders Jake and Hana Elliott, of WHAT. Creative Group, photographer Elizabeth Ratliff, and I partnered with four nonprofits to highlight their exceptional arts programming— post-national budget cuts. A collaborative effort every step of the way, the mural was funded by local business owners and community members, and created by a diverse collection of artists. Their favorite part of the creative process was having the opportunity to build bonds with strangers and focus on a shared interest: the fulfillment and emotional satisfaction they receive from making art. 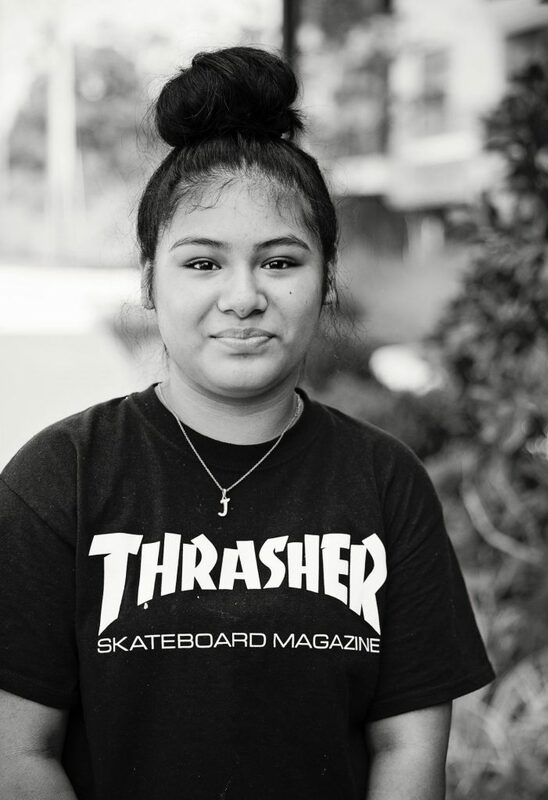 Through the Oasis Center’s International Teen Outreach Program, whose service projects assist students in developing leadership and life skills, Jennifer discovered the Underground Art Studio—a safe space for participants to tap into their creative energy. The Nashville native, whose hobbies are sketching and photography, received a much needed self-esteem boost from this project. It felt good to try her hand at something new and give herself grace as she went along. What is your favorite artistic activity? Jennifer: Collecting photos from random places and then grabbing a notebook where I draw them just for fun. I love combining art and photography. I try to not over think what I’m doing or focus on one particular thing. I just draw what I want to that day. Since you primarily draw as your art form were you nervous at all about painting for this project? Jennifer: Maybe a little, but I also had confidence in myself that I could create whatever I put my mind to. That’s the spirit! What did you create and why? Jennifer: I painted the Nashville skyline with a film reel in front of it because my friends and I go to the movie theatre for fun. What was your favorite thing about this project? Jennifer: I love that everyone who walks by my painting can experience how I feel about Tennessee. It was also nice to feel proud of myself for completing something totally new. Jennifer: That a group of people supports you in terms of whatever you choose to pursue. I get that kind of support here at the Oasis Center. I love that I can learn about others and talk about art, which connects us. Jennifer: I would love to be a traveling photographer. To take photos and spend all day editing them is my dream.